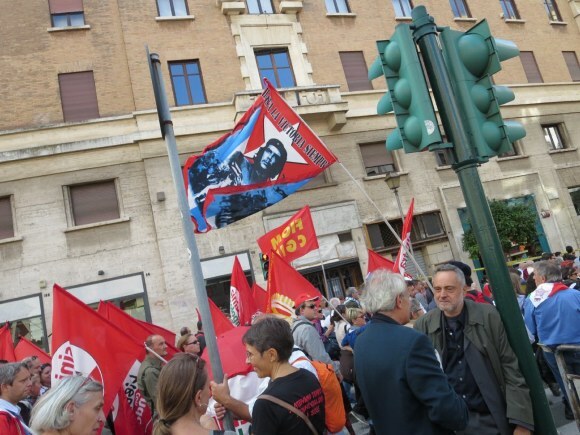 This visit saw the confluence of two events that were quite emotional for some here in Rome. 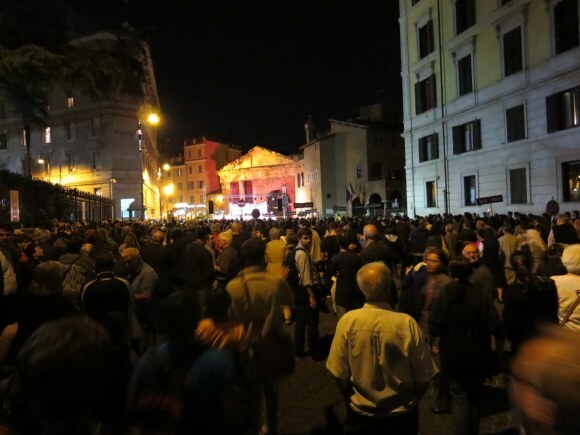 La Razzia: October 16th was the 70th anniversary of the ‘razzia’ or the roundup of Jews of Rome by the Germans. Although they passed the same racial laws as the Germans, the Italians were not very interested in deporting Jews to the concentration camps. In fact after Bulgaria (100%), Denmark (99%) and Finland (99%), Italy (83%) had the next highest percentage of Jews that survived the Holocaust. By October of 1943 the Americans had captured Sicily and had landed on the mainland of Italy at Anzio. The Germans were in retreat but they still had time to roundup the Jews of Rome and deport them to Auschwitz. A little over 1000 Jews were rounded up and all but 16 died. 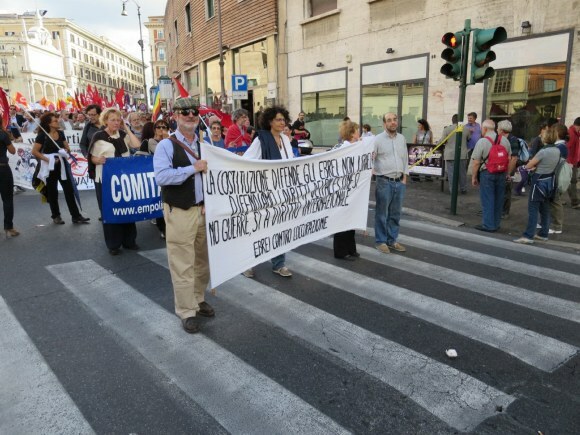 To commemorate the roundup there is a march every year from Trastevere, across the Tiber River, to the Jewish ghetto area at the main synagogue. Hynda and I have observed the march in the past but this year we participated. In the past they had hundreds of people but this year because of the anniversary and the other event of the day there were thousands. The photos attached are from the march. 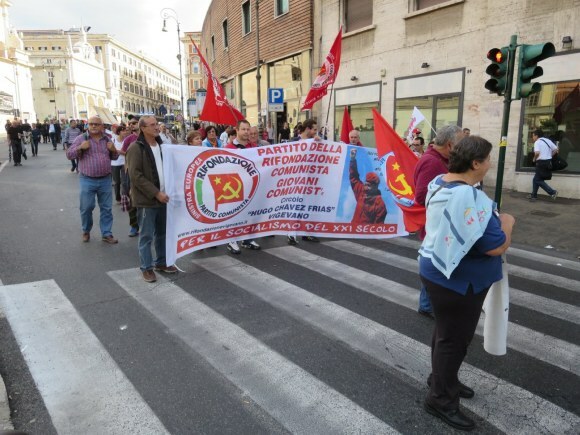 Marching through the main street of Trastevere. Marching across the bridge over the Tiber River on the way to the synagogue. At the plaza next to the synagogue where the roundup occurred. There were several speeches and the main theme was ’20 minutes’ which according to the German proclamation was all the time allowed the Jews to gather whatever they wanted to take with them. 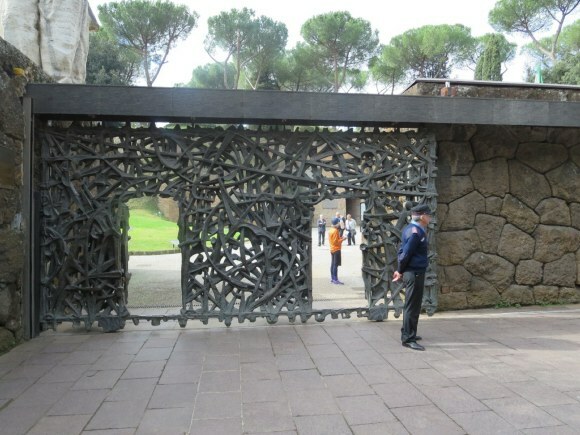 Priebke Death: The other event occurred on the same day as the anniversary march and had to do with Erich Priebke and the massacre at the Ardeatine Caves outside Rome in 1944. In 1944 with the Germans in complete charge of Rome a group of Italian partisans killed 33 German members of the SS. The Germans decided to kill 10 Italians for every German who died. They emptied the prisons, took people from along the street where the killing happened and random people to the Ardeatine caves and shot them in the head. They exploded the entrance to the caves. 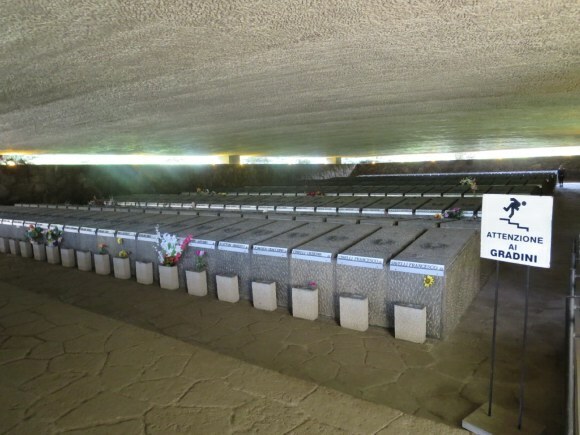 Among the 335 – they killed 5 extra – were over 70 Jews. Since the Jews had been rounded up in 1943 these were the unlucky ones who were either in jail or in the wrong place and were picked up. Eric Priebke was in the SS and was responsible for the list and making sure they were all killed and killing some also. He was caught after the war but escaped and with a false document from the Vatican got to Argentina where he openly lived under his real name. Argentina was known as a good place for Nazis to go after WWII. In 1991, ABC did a show on him and interviewed him in Argentina where he admitted his role, did not deny who he was and showed no remorse. The exposure caused the Argentine government to have to extradite him to Italy after 2 years of legal stuff. 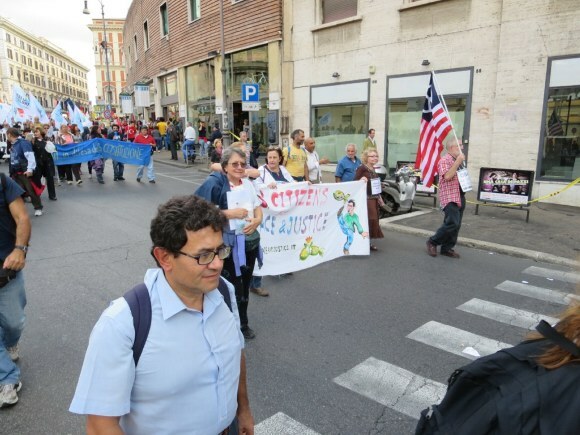 He was tried in Italy and first acquitted since he said he was only following orders. The conviction was finally based on the fact that the orders were to kill 10 for every German death or 330 but he controlled the list and 335 were killed and he personally, as he admitted, killed two… so he was not actually following orders since they killed more than they were supposed to..He was sentenced to jail but because he was old and sick (??) he did not go to prison but was under house arrest here in Rome. He was so sick that he lasted another almost 20 years and just died at 100. The family wanted him buried with his wife in Argentina but Argentina would not allow that. Germany also refused because they said they his grave would become a neo-Nazi shrine. The Catholic church of Italy refused to allow any service in Italy for him. The mayor of Rome refused to allow him to be buried in Rome. 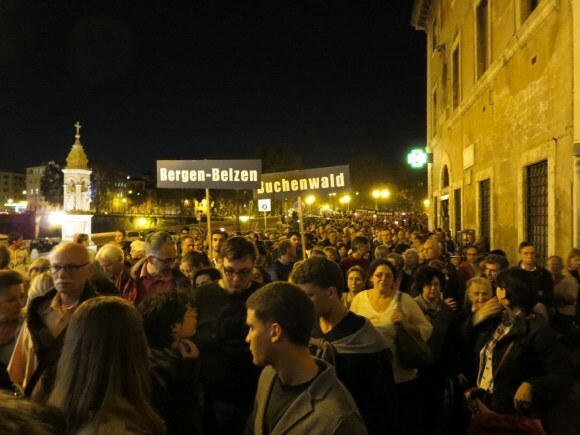 Finally, on the 70th anniversary of the roundup of the Jews he was to be buried in Albano, a town about 12 miles from Rome with a service conducted by the Society of Pope Pius X, a radical Catholic group. 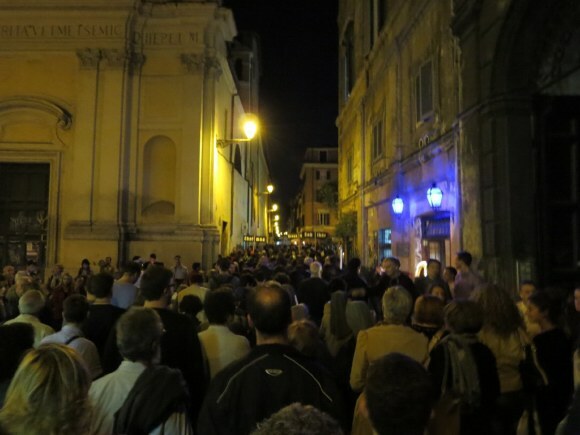 There were huge crowds in Albano that day and they prevented the burial. As I write this the body is at a military airport outside Rome. The attached photos are of the Fosse Ardeatine, the memorial to the slain that Hynda and I visited on our bikes last week. The entrance gates to the Fosse Ardeatine. The bodies of the victims were buried here. Only 323 of the 335 could be identified. 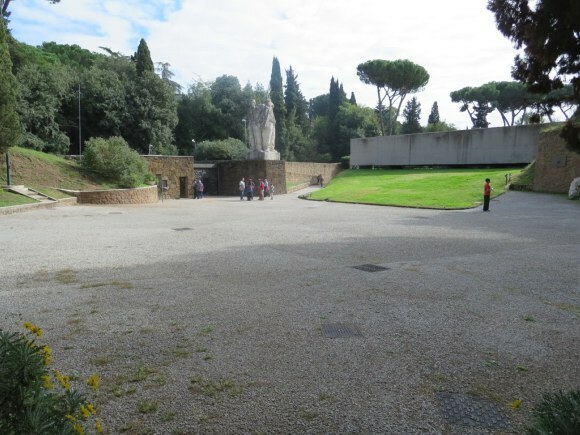 The main entrance plaza at Fosse Ardeatine. 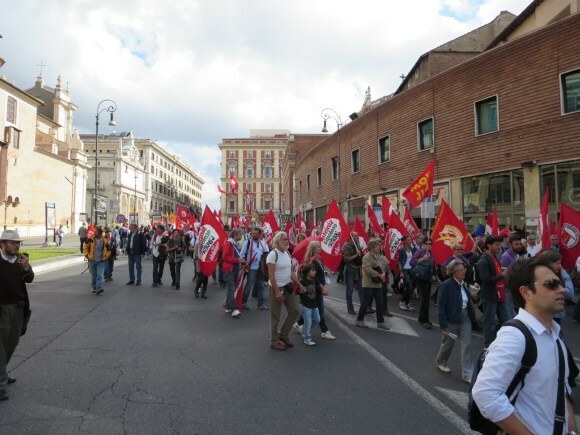 The Usual Ones: We have had the normal number of demonstrations this month. 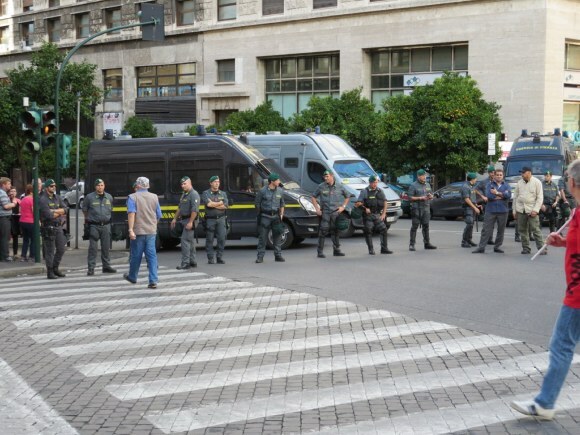 Police lines and police vehicles…. 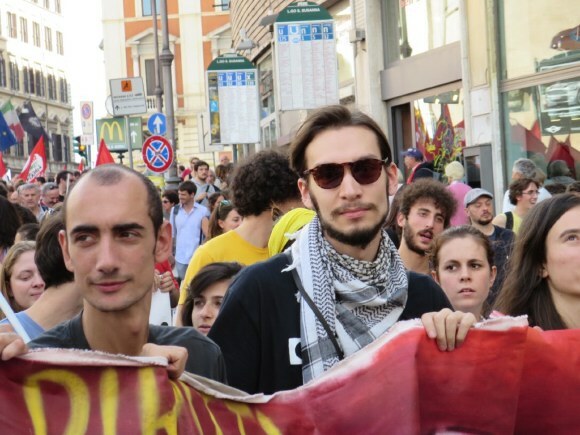 People wearing the Yasser Arafat ‘peace’ scarf even though this march had nothing to do with the Middle East…don’t these people know what a wretched person he was …. 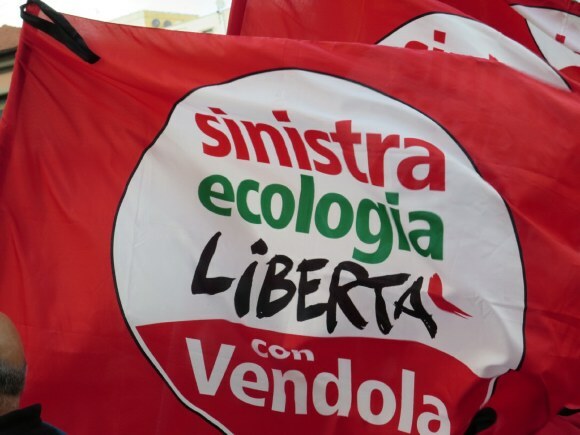 What does left wing have to do with ecology…. ..and the followers of Chavez in Venezuela.. don’t these people know what a wretched man this was….Do they know that he is dead? 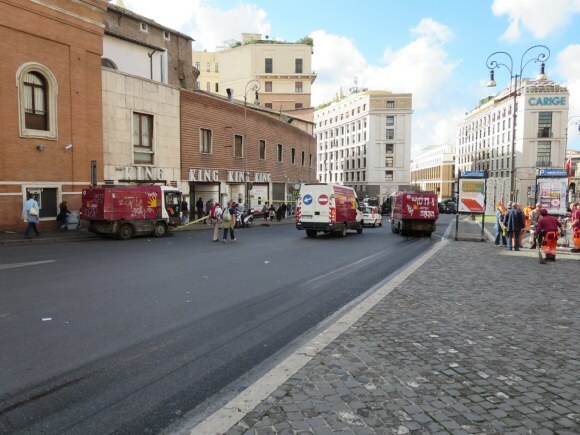 …and the garbage trucks that follow the demonstration and have the streets clean before the last person passes..
March for ??? : The last one featured the ‘black block’ contingent. These are professional demonstrators that dress in black, wear helmets with video cams so they can record the police, carry backpacks with hammers and incendiary devises. Two years ago they broke every ATM machine and torched all luxury cars parked along the route. 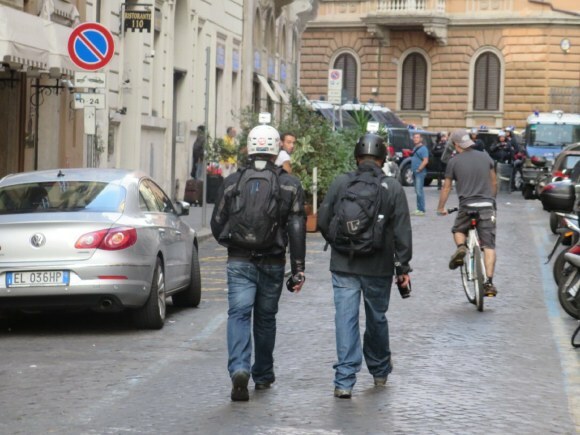 They were back – see photo of two of them on our street – one street away from the demonstration. 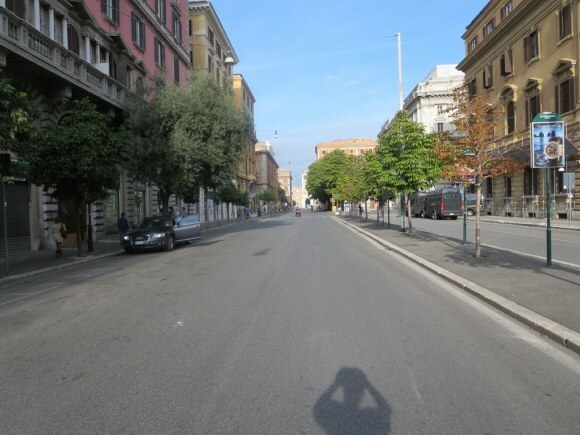 The police did nothing to stop them and there were fires all over Rome for days. This time the police were ready and they only managed to set fire to all the dumpsters and stencil/graffiti all the bank buildings. All the streets in our neighborhood were in lock down mode with no traffic and no bus service. Parliament: In front of the Parliament building there was another ongoing demonstration. 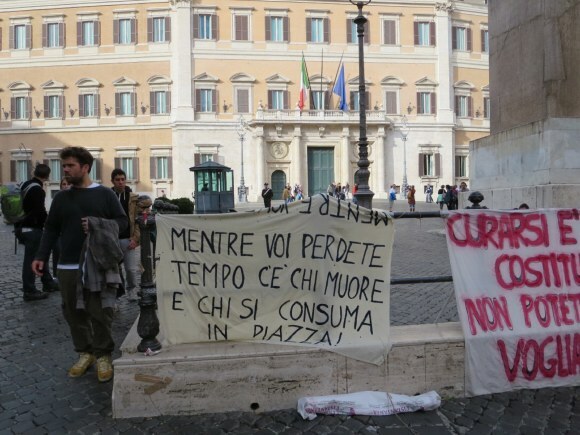 The sign is translated as: While you waste time people are dying and living in the streets. At least this is what we think it means.